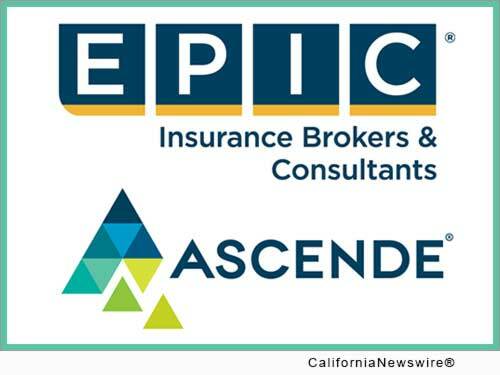 SAN FRANCISCO, Calif. /California Newswire/ — Ascende, Inc., a premier human capital and employee benefits consulting firm, and EPIC Insurance Brokers and Consultants, a unique and innovative national retail insurance brokerage and employee benefits consulting firm, announced today that they have joined forces. Founded in 1995, Houston, Texas-based Ascende is one of the largest independent employee benefits consulting firms in the country, providing solutions in a variety of human capital related fields, including health and welfare, benefit plan administration, retirement, investment advisory, pharmacy management, wellness, communications, global benefit solutions, mergers and acquisitions consulting and human resources consulting services. EPIC, founded in 2007, is one of the 20 largest U.S. retail insurance brokers, with a belief in and reputation for service excellence, innovation, community service, collaboration and having fun – all in the interest of being a "people first" (clients and team members) organization. "Ascende has been delivering strategic guidance and service around benefit programs and HR needs to our clients for over 21 years, and we believe the decision to join EPIC will help us deliver an expansive new set of capabilities to our clients and additional value, with the same commitment to service delivery that Ascende has been a hallmark of our firm. We expect that our clients will immediately benefit from EPIC's broader resources including risk management, property & casualty insurance, workers' compensation, management and executive liability, and private client services," says Ascende Chief Executive Officer Jim Watt. "We are thrilled to join a unique and successful company like EPIC." As part of EPIC, the firm will now operate as Ascende, Inc. – an EPIC Company. Jim Watt will assume additional responsibility as EPIC's President, Southwest Region, and the Ascende leadership team will continue to play vital roles within the larger EPIC organization. Said EPIC CEO John Hahn, "We found a strong cultural partner in Ascende, in an important and highly desirable region, where we have wanted to be a partner in the community and see strong opportunities for growth. EPIC has been investing heavily in our employee benefits consulting capabilities across the country and Ascende, with the leadership of Jim Watt and his team in the Southwest, will add significant value to our clients and create further opportunities for all of our employees' long term growth and career success." EPIC President Peter Garvey added, "In addition to the integration and expansion of our respective benefits platforms, Ascende provides a platform in the Southwest to extend our risk management, property casualty insurance, program solutions and private client services to companies across the region and nationally. We could not be happier to have the entire Ascende team join the EPIC family." The addition of Ascende significantly expands EPIC's employee benefit capabilities nationally, adding nearly 100 top professionals and a strong client base in the Southwest to EPIC's existing team of more than 200 employee benefits professionals across the country. For additional information, please visit http://www.ascende.com/ .